Facts about sweeteners and sugar substitutes. My purpose with this website is to present you with all the facts about sweeteners and sugar substitutes. I do not have an agenda to push one type over another. Nor do I advocate a diet completely devoid of refined sugar. I believe common sense is the best way forward. Moderation and balance is best and you know your body better than anybody else! So enjoy your food. Do you have you a sweet tooth? I do! I love sweet things. Is it possible to enjoy sweet things without damaging your health? Absolutely! Armed with the information in this website you will be able to make informed choices suited to you (and your family - if you are a meal provider) and still enjoy your food. And you may get a few surprises along the way! You won’t find complicated chemical names or molecular structure diagrams on this website. My aim is to keep it simple. It is written for the person who is concerned about what they are consuming, not for the scientist. I have also attempted to make it easy to get to the relevant information quickly. Though each page may contain detailed facts on the chosen topic, I have placed a summary and conclusion at the end. So if you wish to save time you can cut straight to the chase! Do you know how much sugar you consume on average per day? And do you know the amount that is reasonable and safe to take for the average person? Do you know what happens to your body when you consume excessive amounts, particularly if taken over a short period of time and without exercise? Do you know the difference between the various types of sweeteners that are commonly added to the food you eat? Have you heard of high fructose corn syrup, and do you really know what it is and why it is used in your drinks and food? Do you know the early symptoms of type 2 diabetes, what commonly causes it, and the affect it can have on a persons life expectancy, and quality of life? Even if the answer to all the above is yes, you are still likely to discover new and fascinating information about sweeteners that you were unaware of. A huge amount of sweeteners now exist, and are added to everything, from pizza, to chewing gum and toothpaste. Even a very well informed person is unlikely to be aware of some of these substances and the effect they might have in your diet. There are also sweeteners, such as Yacon Syrup, which have a beneficial effect upon the digestive system and can even strengthen the immune response. I have attempted to validate all the data and facts presented, and to be as accurate as possible. If you discover anything on this website that you have reason to believe to be inaccurate, or disagree with please e-mail me. I will investigate and correct if need be! I welcome all feedback! It is possible to spend too much time thinking and obsessing about food. So if possible be informed, get into a habit of eating healthy, and then forget about it! Be spontaneous. Go ahead and have the occasional slice of cake or biscuit. Live life and be sensible. Strive for balance in all things including diet. A Brief Description of the history of Sugar from it's discovery to the Present. Here we look at the trend of increasing consumption of sugar including high fructose corn syrup and other sweeteners. Lists just about every sweetener that exists! Types of Sweetener broken down into 6 catagories. Tables that show Sweetener Values including calories, glycemic index, and sweetness relative to sugar. The table shows FDA guidelines for acceptable daily intake for artificial sweeteners and how this translates into cans of coke or soda allowed. Comprehensive list of sugar substitutes that are low in calories, and have a low glycemic index. 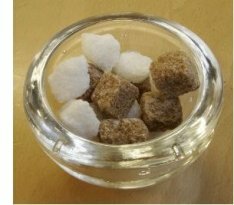 Details about all types of natural sweeteners including zero calorie varieties such as stevia and caloric sweeteners such as honey etc. Natural Sweetener List covering Zero Calorie Sweeteners and Caloric Sweeteners such as Honey. Each sweetener is rated for taste and health issues and conclusions are discussed at the end of the page. Are artificial sweeteners safe? Which are the safest to use. What are the issues? Everything you need to know. Full Artificial Sweetener list including all types available worldwide. Each sweetener is rated for safety and taste and conclusions are discussed at the end of the page. Comprehensive breakdown of sugar quantity in foods and beverages broken down into serving size and product size for most common items. Blood sugar level is an important health issue, a little knowledge and understanding of this issue is more important than ever as rates of diabetes remain high. Difference between probiotics and prebiotics, and the effect of sweeteners on gut health. The Glycemic Index is an indication of how quickly a specified amount of food will cause a rise in blood sugar level. The table shows Glycemic Load for typical portions. Table showing Glycemic Index for Sweeteners. Discussion on the merits of choosing one option over another. The Glycemic Load List is sorted into three groups, low, medium and high. Diabetes is a disease in which blood sugar levels are are not properly regulated by the body. Body mass index is an indication of desired weight for a given height. If you have comments or suggestions please submit them using the form on this contact page. List of raw sweeteners that conform to the definition of raw food i.e. minimal processing at no more than 40 degrees centigrade. Sweetener NewsInformation regarding sweetener news, and developments taking place in the sweetener market.